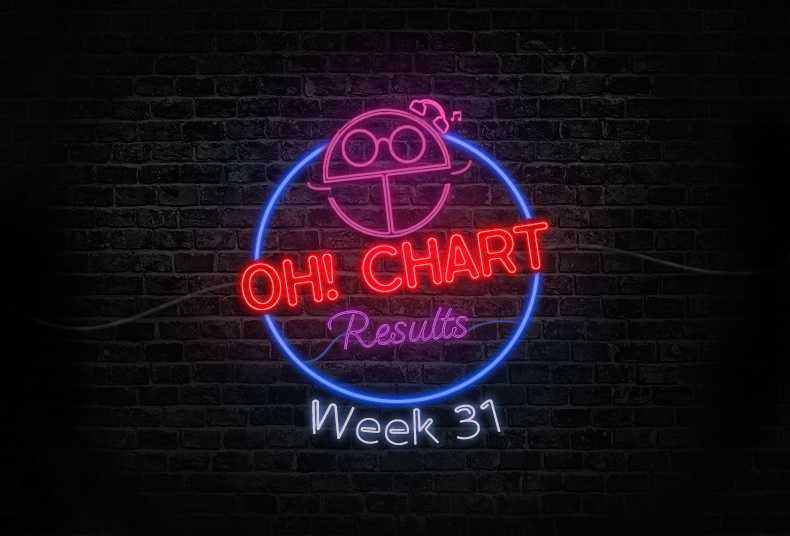 One of K-pop’s top male groups rose up to the occasion to claim a landslide win on their OH!Chart return. With eight new nominees, the results were closer than ever. Former triple crown winners Wanna One recorded a landslide victory for their comeback track, “Beautiful”, with 25.37 points. The winner of the last two weeks, TWICE, dropped one spot to come second for their smash hit “Likey” on 11.38 points. Veteran artist Yoon Jong Shin and company artist Min Seo’s duet “Yes” wrapped up the podium spots with 9.72 points. Wanna One’s mammonth win was secured by smashing the physicals category with 413,415 copies. SM Entertainment’s evergreen boy group Super Junior came second after they sold 31,794 copies. Fellow boy group Seventeen took out third place with 28,738 copies. In the downloads category, Wanna One’s crushing form continued with another first place finish on 250,757 hits. Yoon Jong Shin and Min Seo finished second with 202,813 hits – the only other nominee who notched more than 200,000 hits. Wanna One’s B-side track, “I Wanna Have” came third place on 132,584 hits. Melomance’s “Gift” easily won the streaming with 7,319,699 hits. Korean R’n’B crew Urban Zakapa finished in second spot on 6,984,808 hits. Former winners EPIK HIGH rounded out the top three for “Love Story” featuring IU with 5,239,637 hits. TWICE once again drew the most votes in the OH! category on 41 votes. Super Junior notched 23 votes in second place while Wanna One claimed third on 17 votes. “Beautiful” is a medium-tempo and uplifting track by Wanna One which depicts a longing feel of missing a loved one. The emotional vocals and sincere rap matches well together. However, the line that really pulls the heartstrings is, “I miss you so much” during the verses. It perfectly fits in with the story of the MV – two lost kids reuniting with each other. Every aspect of “Beautiful” simply hits the mark and it will be no surprise if it continues to succeed on all platforms. Can Wanna One repeat their success? Will idol groups continue to take control? Or will a debutant stun the field? Let us know your thoughts below!